The designations employed and the presentation of material in this publication do not imply the expression of any opinion whatsoever on the part of the Food and Agriculture Organization of the United Nations concerning the legal status of any country, territory, city or area or of its authorities, or concerning the delimitation of its frontiers or boundaries. Opinions expressed in this publication are those of the author alone and do not imply any opinion whatsoever on the part of FAO. The copyright in this publication is vested in the Food and Agriculture Organization of the United Nations. This publication may not be reproduced, in whole or in part, by any method or process, without written permission from the copyright holder. Applications for such permission with a statement of the purpose and extent of the reproduction desired should be made through and addressed to the Senior Food Systems Economist, FAO Regional Office for Asia and the Pacific, Maliwan Mansion, Phra Athit Road, Bangkok 10200, Thailand. The frequencies and impacts of natural disasters have increased and are linked to critical trends such as hunger rising poverty, population density, environmental degradation and climate change. Nearly two-thirds of all natural disasters in the last two decades in Asia have been of hydro-meteorological origin. These have their greatest impacts on the agriculture sector. As Asian and Pacific communities are heavily dependent on agriculture, they have become increasingly vulnerable. FAO, in its Strategic Framework for 2000-2015 has included a plan to address preparedness for, and effective and sustainable response to food and agricultural emergencies. It has identified disater prevention, mitigation and preparedness and post-emergency relief and rehabilitation as a priority area for inter-disciplinary action (PAIA) in its Medium-Term Plan (2002-2007) . This programme is to be implemented trough a relief-development continuum - a series of eight types of action, or phases for interventions namely prevention, preparedness, early warning, impact and needs assessment, relief, rehabilitation, reconstruction and sustainable recovery. FAO has also clearly signaled that development objectives should not and cannot be se aside during emergencies. The FAO Regional Office for Asia and the Pacific has adopted "Disaster Prevention, Mitigation and Preparedness and Post-Emergency Relief and Rehabilitation" as one of the four Priority Areas for Inter-disciplinary Action (PAIA). It is aiming for a paradigm shift in natural disaster management strategy: from hazard to vulnerability focus, reactive to proactive policies, relief to prevention and preparedness approach, response to risk management, and from planning for communities to planning with communities. 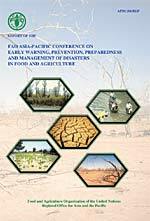 This publication is the proceedings of teh Asia-Pacific Conference on Early Warning, Prevention, Preparedness and Management of Disasters in Food and Agriculture, which was organized by the FAO Regional Office for Asia and the Pacific in Chiang Mai, Thailand from 12 to 15 June 2001 to launch RAP's PAIA on disasters. I have no doubt that the recommendations of the Conference will contribute to sound and effective policies and programmes for prevention and management of disasters in the food and agricultural sector leading to sustainable food security and poverty alleviation.